2018 Seoul Christmas Festival (SCF) is being held along the areas of Cheonggyecheon (Cheonggye plaza – Jangtong Bridge) from Dec. 8th – Jan. 1st, 2019. The SCF is hosted by the Kyunghyang Shinmun, C Channel, Agape Cultural Foundation, and Baekseok Art University, and is organized by Organizing Committee of 2018 Seoul Christmas Festival. 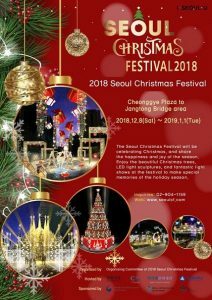 The festival will hold its opening ceremony to commence its 4th season by lighting the mega Christmas tree at Cheonggye plaza on 12/8, and will continue the celebration of the season throughout the festival period. During the festival, visitors can enjoy Christmas themed arrangements along the 1.2km of Cheonggye stream, media arts in LED display zones, performances and events, to celebrate the holiday season. At Cheonggye plaza near the mega Christmas tree, daily performances and interactive programs are scheduled to entertain the visitors. This winter at Cheonggye stream, glowing lights in the following 5 themed areas will welcome the visitors: ‘Dream Show Zone’ – application of modern technologies on the classic European gothic details; ‘Joy zone’ – replicated special effects of fireworks; ‘Santa zone’ – with themes related to Santa Claus and gifts; “Blessing zone” – inspired by the birth of baby Jesus and the three wise men; and “Happy zone” – demonstrating Korean traditional style gates and heart-shaped props.